Wouldn’t it be wonderful if every idea we had was immediately embraced by others, every word was explicitly understood and interpreted correctly and every plan of action was seamlessly implemented without hesitation or challenges? I don’t know about your world, but this rarely, if ever, happens within my world. 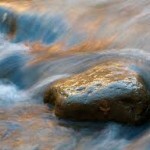 At times it seems as if obstacles are strategically placed to impede our progress. A colleague needs clarification before agreeing to participate in an initiative, plans need to be reworded or reworked before receiving final approval or timelines need adjusting for a variety of reasons. 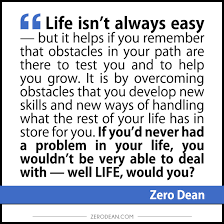 I will admit that occasionally I’ve looked upon those obstacles as “signs” that things were not meant to be or that my time and energy needed to be elsewhere, only to dig a bit deeper and ultimately develop a deeper appreciation for those obstacles as each one of them was an opportunity for growth and learning. It has been through those additional conversations, where I have had to articulate an idea more thoroughly or provide more explicit explanations that I’ve developed a deeper understanding or a different perspective on my original idea. It has been through those “road blocks” and timeline adjustments that I’ve been able to develop more creative ways of working through the process and more unique ways of meeting the end goal. If it weren’t for those obstacles, my thinking would not have been pushed. I would have able to coast on autopilot and cruise to a known solution, which would not have been nearly as creative or unique. 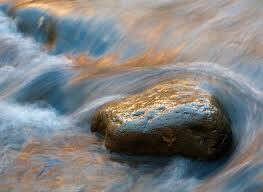 Rocks placed in a running river don’t stop the water, they cause it to run faster and create additional movement. When obstacles are placed in our way, we don’t stop, we become resourceful and innovative and end up with a better product and ultimately embed ourselves in a powerful learning journey. What obstacles have you overcome and what did you learn about yourself in the process? In writer’s workshop 101 you learn to capture the reader’s attention with a catchy title. Did it work? This past weekend we were treated to a day of gorgeous sunshine and temperatures which climbed to single digit minus degrees. It was a wonderful reprieve from the polar vortex that has been enveloping southwestern Ontario for the last month. 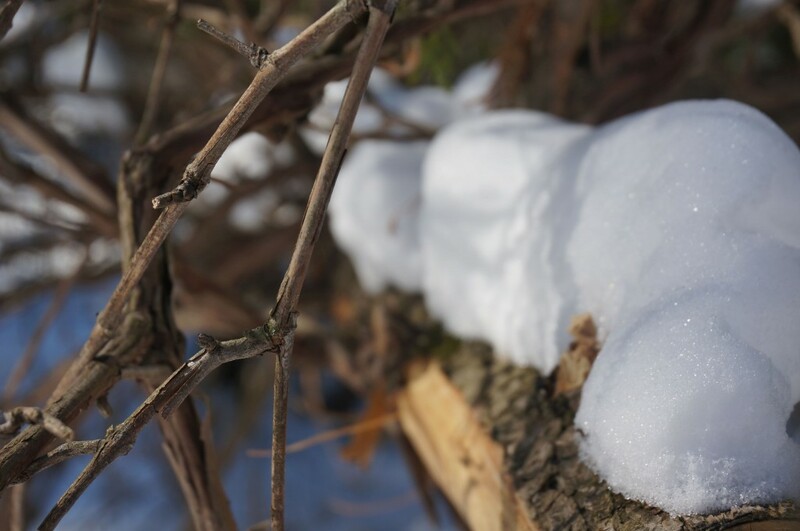 I decided to take advantage of the “warmth” and headed to the Komoka trails, complete with camera around my neck, with the intent of capturing some pictures of birds for a project that I’m working on. These trails are ones that I’ve enjoyed in the summer, spring and fall as they burst with different colours depending on the season and meander along the Thames River which also changes with the seasons. 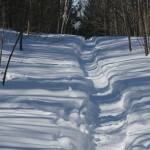 Within minutes I was struck with the beauty of the trails in winter and I noticed things that I have never noticed before during my numerous hikes. I began to wonder if sometimes the sensory overload of colour takes us away from an underlying beauty. 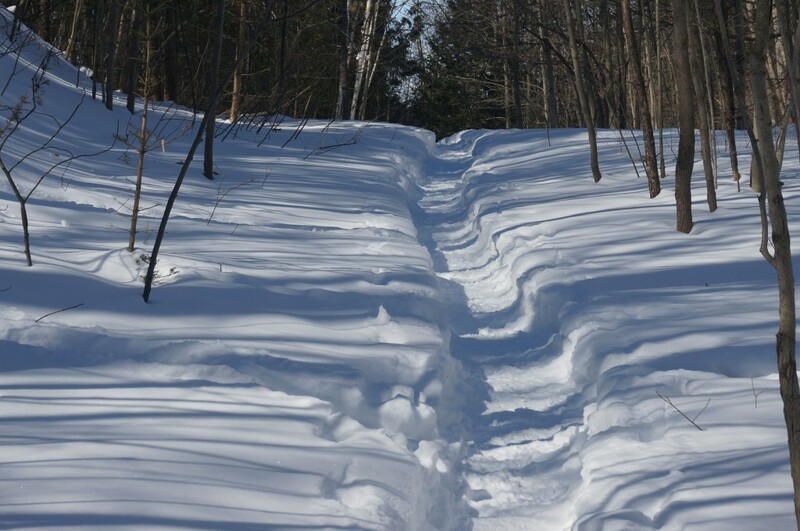 Without the leaves, the trees lining the pathway formed a perfect archway and their shadows created a symmetrical pattern in the snow. Shades of white became part of a beautiful mosaic of nature’s beauty. The intersection of branches and twigs created statues which, if you let your imagination flow, resembled great works of art. 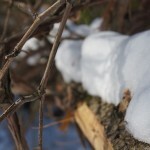 As I continued my hike, I captured the intensity of the sun on the snow. 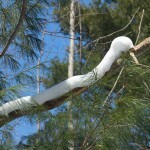 Within trees, what once were blankets of snow were beginning to melt and create artistic representations. 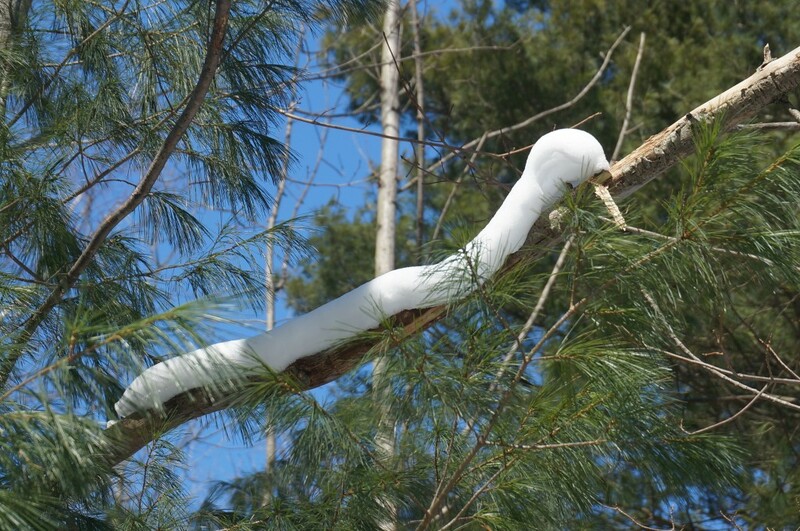 Some of them resembled large white caterpillars slithering along branches, complete with shape, depth and design ~ yet all in white! We can only hope that within a few months colourful, real caterpillars will be doing just that. Persistence is a common theme in many of our schools these days. We share novels, picture books, videos and picture quotes to give our students a sense of what persistence means. 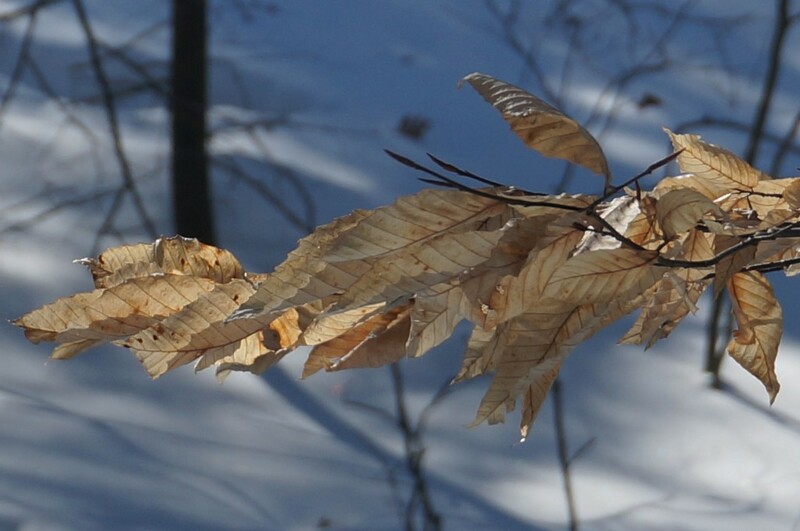 With a winter as severe as the one we’re in the middle of, I was astonished to see a few trees who were still clinging to leaves which refused to drop, in spite of the wind, snow and frigid temperatures ~ nature’s reminder that with the strength of resolve, we can weather any storm. Like most of us, I am looking forward to the warmer temperatures of the spring and the colourful reminder of rebirth and renewal. 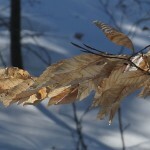 But today’s hike reminded me that beauty and depth of colour and a visual experience can occur within shades of white.